The national mood in Brazil is grim, following a year in which more than a million people have taken to the streets of major cities across the country to protest corruption, rising inflation and a lack of government investment in public services such as education, health care and public transportation, among other things. A new survey by the Pew Research Center finds that 72% of Brazilians are dissatisfied with the way things are going in their country, up from 55% just weeks before the demonstrations began in June 2013. Opinions about the national economy have changed even more dramatically over this one-year period. 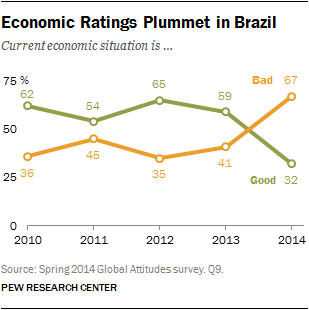 Two-thirds now say Brazil’s once-booming economy is in bad shape, while just 32% say the economy is good. In 2013, the balance of opinion was reversed: a 59%-majority thought the country was in good shape economically, while 41% said the economy was bad. Economic ratings had been consistently positive since 2010, when Pew Research first conducted a nationally-representative survey of Brazil. Brazilians are also concerned about the impact that hosting the World Cup, which begins June 12, will have on their country. About six-in-ten (61%) think hosting the event is a bad thing for Brazil because it takes money away from schools, health care and other public services — a common theme in the protests that have swept the country since June 2013. Just 34% think the World Cup, which Brazil will host for the first time since 1950 and which could attract more than 3.5 million people to the nation’s twelve host cities, will create more jobs and help the economy. There is also skepticism about the international benefit of hosting the World Cup. About four-in-ten (39%) say it will hurt Brazil’s image around the world while an almost equal number (35%) say it will help; 23% say it will have no impact. These are among the major findings from the latest survey of Brazil by the Pew Research Center. The survey is based on face-to-face interviews conducted between April 10 and April 30, 2014 among a representative sample of 1,003 randomly selected adults from across the country. The survey also finds widespread concern about rising prices: 85% say this is a major problem in the country. And at least two-thirds also say a lack of employment opportunities and the gap between the rich and the poor are very big problems. In addition to economic concerns, large majorities also describe crime (83%), health care (83%), political corruption (78%) and poor quality schools (64%) as major problems. To be sure, these are not new challenges in Brazil. Pew Research surveys conducted since 2010 have documented similarly widespread concern with a range of social, political and economic issues, including crime, corruption and inflation. But the current level of frustration Brazilians express with their country’s direction, its economy and its leaders is unmatched in recent years. Brazilian President Dilma Rousseff receives overwhelmingly negative ratings for her handling of important issues facing the country. And while about half say the president is having a positive influence on the way things are going in the country, this is in sharp contrast to opinions of Rousseff’s predecessor and supporter, Luiz Inácio Lula da Silva, in the last year of his two-term presidency. In 2010, more than eight-in-ten (84%) said Lula was having a positive impact on Brazil. Like Lula, Rousseff receives better overall ratings from those with lower incomes and lower levels of education. But while Lula’s influence was seen in a positive light by majorities across all demographic groups, Rousseff receives negative ratings from most Brazilians with a post-secondary education (70%) and higher incomes (61%).1 Majorities of those with a primary education or less (56%) and lower incomes (58%) say the president’s overall impact on the country is positive. Opinions of Rousseff’s handling of specific issues are far more negative than assessments of her overall influence. Clear majorities disapprove of the way the president is dealing with all nine issues tested: corruption (86% disapprove), health care (85%), crime (85%), public transportation (76%), foreign policy (71%), education (71%), preparations for the World Cup (67%), poverty (65%) and the economy (63%). Disapproval of the president’s handling of key issues is high across demographic groups, but tends to be particularly widespread among the more affluent and more educated, as well as among those who live in urban areas. Yet, despite her low approval ratings, the president is viewed more favorably than her main challengers in the October election, who remain less well known. Roughly half (51%) have a favorable opinion of Rousseff, who represents the Workers’ Party (PT), about double the share that say the same about Aécio Neves (27%), the candidate of the Brazilian Social Democracy Party (PSDB), or Eduardo Campos (24%) of the Brazilian Socialist Party (PSB). All three candidates have unfavorable ratings hovering around the 50% mark. Roughly one-in-four do not offer an opinion of Rousseff’s challengers. 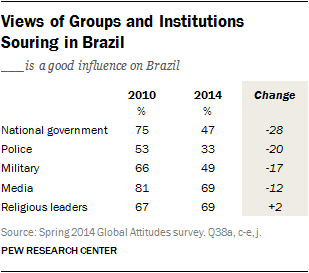 Brazilians express far less confidence in key groups and institutions than they did four years ago. Fewer than half (47%) say the national government is having a positive influence on the way things are going in Brazil, down from 75% in 2010. The police, already among the lowest-rated institutions in Brazil four years ago, receive even less support today. Amid reports of excessive use of police force during last year’s protests and highly publicized cases of police brutality, just 33% of Brazilians currently say the police are having a good influence on their country, compared with 53% in 2010. Similarly, about half (49%) now say the military is having a positive impact on the way things are going in Brazil, down from the 66% that shared this view in 2010. And while the media still receives mostly positive ratings, fewer say its influence is positive than did so four years ago (69% vs. 81% in 2010).